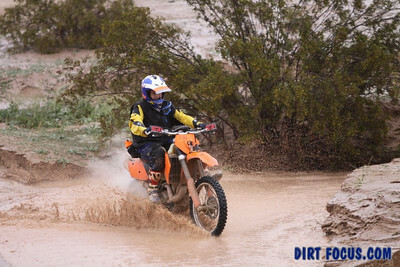 My first KTM four stroke was a used ‘01 400mxc, a nice all around bike. Yet my love affair with the RFS bikes really started at the 2002 ISDE. Via a long set of circumstances I ended up having to race a bike different than what I had planned. I had a GasGas ec300 all prepared, only to find out the AMA had entered me in the wrong class. Literally at the last minute I had get a 400 from KTM and roll it into impound with 1.5 miles on the odometer. I had to start my first ISDE on a bike that had only been ridden across the parking lot. 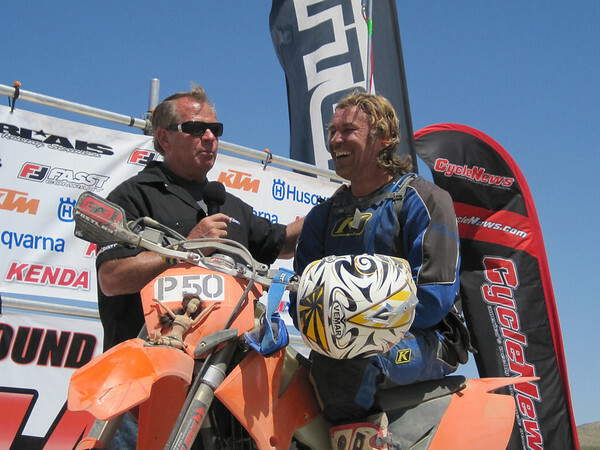 After six days of racing in extremely difficult circumstances, in an event where only half of all the riders finished, the trusty 400exc brought me to the finish. I never really had to put a wrench to it during the event. Two oil changes and a couple of air filters were all the attention it received. That bike still sits in my garage, now relegated to an easy life of infrequent trail rides. In the years since, I have actually owned all kinds of different brands and models. In 2005 I purchased the newer generation 450mxc. KTM had quite a few of these sitting around and there were some good deals to be had. Since that time the RFS has remained my primary ride. I have had a few two stokes along the way, yet I find them fun but impractical for my type of riding. In the desert they are not stable enough and for trail riding I need a longer fuel range. Trail or race, nearly all my riding takes place in the desert. So both bikes will be set up with that in mind. My favorite desert terrains are the tight rocky canyons and difficult mountain climbs, the tougher the better. That is where I excel, where I struggle is on the open fast valleys. So the set up dilemma is whether to focus on the part I enjoy or the sections I struggle in. Ultimately I will give up a little high speed in order to have a bike that can charge through the rocks smoothly, that way I have the most fun. So my thought process now is to start with two identical model bikes and prep one as my primary race mount and set the other one up as my trail and dual sport bike. Initially I was a little concerned that I would not be as happy with the 450xc model as I had been with the previous version I owned, a 2007 525xc. One race was enough to wipe that concern away. While the power of each is different, they also each have their strong points. The 450 has plenty of power and the fact that it will rev just a little quicker means it can get right into the meat of the power band quickly. One of the ideas behind having two bikes is that if something breaks, I can just grab the same part off the other bike and be ready to go. It is like having a complete set of spares. The preparation of the two is aimed toward having as many like parts on each as possible. The first and primary task is the suspension. It is really the only area that needs serious attention. Javier at Trail Tricks has set up a number of bikes for me in the past and his work with KTM’s is excellent. Both bikes get identical valving and .46 n/m springs in the forks. With these settings the bikes can tackle anything from casual trail riding to motocross practice. Just a few clicks on the compression will provide plenty of adjustability for any conditions. For the shock I asked for the race set up to be just a little stiffer. Javier’s standard shock set up is just a little soft for my weight and riding level. So the race shock has one more shim that the trail shock. Each is held up by an 8.8/260 spring. I run the standard sag at 35mm for aggressive moto conditions and back it off one turn for trail and desert racing. The extra sag helps keep the bike very stable and tracks well through the whoops without kicking. My results with this set up have been very good. I find the 450xc race bike to be more stable than the 2009 KTM 450xcw that I had. The chassis tracks better on the faster sections. One of the other things I have noticed was that the 09 bike bottomed much easier simply due to its lower ground clearance and that had been significantly effecting how hard I could charge through rocky desert terrain. Carburetor set up was the next on the list. For the race bike I am running a basic SX package with the OBDTP needle in the 4th position, 185 main, 42 pilot and 1.5 on the mixture screw. On the trail bike I am experimenting with the JD blue needle and 175 main. The JD setting does seem to give improved gas mileage. 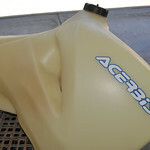 Both bikes get the Honda pumper diaphragm with the longer post to reduce the squirt timing. As radically different as these set ups sound, both work good and do the job they need to. As for personal preference items, both bikes have Flexx bars, Fastway steering stabilizers and ODI bolt on grips. The trail bike has an Enduro Engineering tall/hard seat and the race bike retains the stock seat. Gearing is 15/50 and 14/50 respectively. I find the 15 tooth countershaft to be needlessly tall for desert racing, but it provides a good highway gear for dual sporting. The stock exhausts were pretty good but both lacked a spark arrestor. The trail bike now has an FMF Q4 and the race bike has a new generation SXF canister mated to a Pro Moto Billet sparky end cap. The race bike also has a Rekluse Z-start Pro model auto clutch. Every time I ride these bikes they feel like old friends, like that well worn glove that fits just right. I just completed a week of riding the trail bike in Baja. My only thought the whole trip was that I could probably use a little more lighting output. I run a Baja Designs mask with a glass lense and 55/65 bulb. It is enough to get by with, but just barely. The trail bike had many hours of hard life on it when it came to me. Then, at the “once in a life time” crazy muddy Ocotillo National Hare and Hound, it ingested some sand, enough to coat the carb intake. So this bike is starting feel a little tired and will be due for some R&R soon. I am fortunate enough to get to ride and test lots different new bikes. The big question is, am I going to ride something new that is going to turn my head away from these bikes? I have just completed a long term test with the Husaberg and I also rode the new 300xcw last week. I like both bikes and each certainly has its strong points. So today I was off to the local track to ride my own race bike for the first time in a couple of weeks. After a day of pounding out moto practice, the verdict: I still love my RFS bikes. The motors are a blast and with the suspension set up correctly they will run very close to even the newest bikes. I still have a long list of things I would like to do to each of these bikes, particularly the trail bike. So stay tuned as I work on a dual sport kit, custom graphics, a huge gas tank and well, who knows what else I might decide to try.